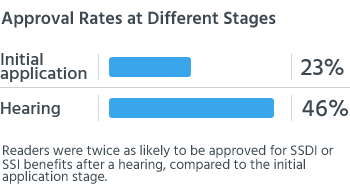 Our survey showed that the likelihood of getting approved for SSDI or SSI nearly doubled from the initial application to the disability hearing. If you've applied for benefits through Social Security Disability Insurance (SSDI) or Supplemental Security Income (SSI) and have been denied, you're probably wondering whether it’s worth it to appeal. We surveyed readers across the U.S. who applied for SSDI or SSI to find out about their experiences with the application and hearing process. Here’s what we learned about the outcome of their claims at different stages in the process—in particular, what happened when they requested a hearing after their application was denied. Our survey results supported what many people suspect—that it’s difficult to get Social Security disability benefits. But it may surprise some people to see what a big difference it makes when applicants persist after an initial denial and follow through with the process. Less than a quarter of our readers (23%) were approved for benefits at the initial application stage. The others were denied either because they didn't meet the work history and/or financial requirements (referred to as "technical denials") or because they didn't qualify medically for SSDI or SSI. But if you're denied for medical reasons, you can appeal by requesting a hearing in front of a judge (although most states require that they go through a reconsideration review first). 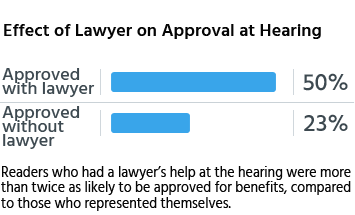 Meanwhile, readers who didn’t get a lawyer’s help were only slightly more likely to win benefits at the hearing stage than at the initial application. One reason that applicants with legal representation fare better at the hearing stage has to do with how lawyers are paid to work on SSDI and SSI cases. Disability attorneys are almost always allowed to charge a fee only if they win benefits for their clients. Because of this “contingency fee” arrangement, lawyers generally have a screening process for potential clients; they’re more likely to take cases that appear to have a decent chance of success. There are several other reasons that having a lawyer makes such a big difference in the outcome of SSDI and SSI claims at the hearing stage. An experienced disability attorney can help you gather the right kind of medical evidence that will support your case. That includes knowing when your medical records need updating and when a medical expert would help. (It also means knowing where to find the right experts.) Government statistics from 2017 showed that when a medical expert testified at a hearing, the disability applicant was 1.6 times more likely to be approved for benefits than other applicants. Because these medical professionals are there to give expert, impartial opinions, judges tend to value their testimony when making their decisions. "My attorney prepared my profoundly well-documented case and made an excellent presentation at my hearing. He coordinated with one of my therapists to speak on my behalf so that I only had to answer three very simple questions. This process is entirely too overwhelming to accomplish without the assistance of a skilled and caring disability attorney." Why Doesn't Every Denied Applicant Request a Hearing? Given how much a hearing improves the chances of success in getting Social Security disability benefits, it may be surprising to learn how many applicants give up when they get that first denial letter. 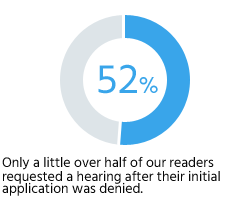 Only a little more than half of our readers requested a hearing after their initial application was denied.